Commissioned by Abbey of the Arts, this reflective collection of songs and chants accompanies the book "The Soul's Slow Ripening: 12 Celtic Practices for Seeking the Sacred." 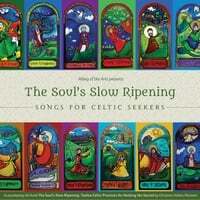 Features compositions by 7 dynamic artists embracing the Celtic spirit. Commissioned by Abbey of the Arts, this evocative collection of chants and songs includes 12 original compositions by a handful of spirited artists: Richard Bruxvoort Colligan, Simon de Voil, Sherri Hansen, Margo Hennebach, Margaret McLarty, Deirdre Ní Chinnéide, and Sara Thomsen. The collection also honors 12 Irish saints who connect listeners to the ancient Celtic practices as tended by Christian monks and mystics through the ages. Abbey of the Arts is a virtual global online monastery offering pilgrimages, online retreats, and resources which integrate contemplative spiritual practice, creative expression and monastic spirituality. This resource is one of many created by the Abbey to support you in becoming a monk in the world and an artist in everyday life. Poetry is our nourishment. Art inspires our souls. We dance for the joy of it. Join us at Abbey of the Arts!